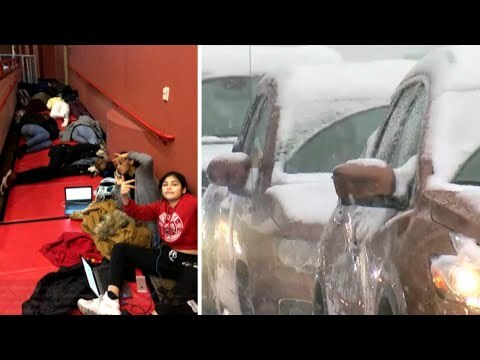 Snow in the Northeast caused such unsafe driving conditions that students in New Jersey were forced to stay overnight at their school. Pictures posted by Liberty Middle School show a play-by-play of the night’s events after the district canceled bus routes. The storm was originally expected to bring just one to three inches of snow to the area but when almost eight inches arrived, everyone’s plans radically changed. InsideEdition.com’s Keleigh Nealon (http://twitter.com/KeleighNealon) has more.